I have an old friend; a fellow climber I’ve been recently reunited with after years apart simply because of the sheer land mass and great seas which divided us. We first meet at the Belfast climbing wall at the university where he studied physics and where I was a mere nomad; exploring the city streets and troubles, learning about photography in the lightest of darkrooms, and simply allowing the beautiful accents to fill my thirsty ears. Not yet a full-fledged climber, my spare time was spent dabbling. Climbing with all its lightness was new to me. Gustau and his beautiful family came to Magic Wood for ten days. Our days were spent with the kids: exploring the rivers, villages, and of course, bouldering when it was dry and hiding under shelter when it rained. Climbing with him had changed little. He remains a thoughtful person, light in mood and character. The timing of their arrival was with that of my visit to the darkside. How unfortunate that they had to put up with my tortured soul!!! But he is an old friend, a status normally carrying with it acceptance of another in any state. Witnessing a friend in the darkest of places while at the same time, showing complete acceptance, non-judgement and love is beyond what words can describe. It instilled in me a level of trust and respect and redefines the meaning of unconditional and true friendship. While climbing he would think of the intricacies of each move, trying to solve it as if it were a physic problem. Too much weight on this foot, more weight here… Standing before the climb with his eyes closed, he’d mimic the moves with his hands, climbing the problem in his mind before his feet left the ground. His methods made me smile as I watched his mind analyze each move. When he fell, he’d release such a great roar of energy, and then quickly work to resolve the glitch in his movement. When he succeeded, he would again, release the same great roar. He believed the celebration of success to be as crucial as the analysis of each failure. After observing me on my latest project which entailed countless falling, he pointed out his realization that climbing at your limit meant experiencing failure a thousand times over; it meant accepting failure as the norm rather than success. 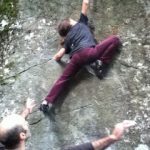 This got me thinking about the relation between the daily failures I experience in climbing which on a ‘good’ day, send me spiraling into feelings of pure enjoyment of the process of working and solving a problem; while on a ‘bad’ day, the same amount of falling can tinge me with an overcast of dissatisfaction and frustration. At one point, Gustau witnessed me in such defeat that I declared my complete frustration for climbing. With one simple statement from him my thoughts went on a spur. “Remember back when climbing was fun?” Oh yeah, I do, so fun… Friends and lightness in plenty, simplicity, cruxes proved challenges not torments. 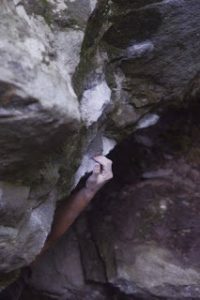 So yes, I do remember when climbing was fun… However, despite my impatience and frustration when climbing presents a seemingly insurmountable challenge, climbing remains fun, even if sometimes, in a weird, painful sort of way. Accepting failure as the norm is certainly true, especially as of late when the ratio of falling and sending seems to be 99:1 percent. With this in mind, Gustau’s idea that celebrating success is important takes on new meaning for me. Focusing on any progress made becomes important to avoid the potential torment and drudgery that superficial failure can produce. All the same, reveling over something achieved is something that, for semi- unexplored reasons, to a degree, I suppress. Perhaps it feels outside my comfort zone or I view the accomplishment as ‘not a big deal’; maybe I confuse it with boasting; either way, the idea that celebrating success is important sent me into a fury of thought. Does it come back to the ideas we were raised with that perceive modesty and unassuming behavior in the midst of accomplishment as the greater? Yet isn’t the idea of humility just as much a scheme of the ego as reveling in something achieved? Surely one can celebrate victory without guilt and at the same time, remain humble. Wouldn’t celebrating make the neurons for success stronger so to pave the way for more of it? 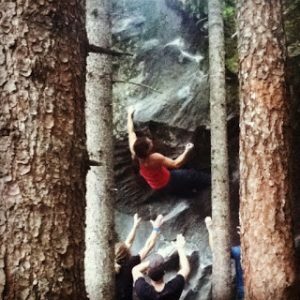 But really, what is success then: topping out a boulder or never giving up…? And failure? Is it falling or simply giving up or even not trying? Doesn’t that old saying go something like: ‘it is better to have tried and failed then to have never tried at all’…? As I face seemingly insurmountable challenges that test my patience and poise, I ask myself why I climb. As climbers, is it really the summit that we aim for or is it something else that we chase with an eternal thirst that we know is secretly unquenchable. As for myself, I beg for the later, for when one boulder is topped, my mind almost immediately goes to the next challenge, the next test as it were. To exhaust our bodies and minds as far as they can go, to put so much effort into one try that you’re whole being lets out the most unconscious scream of effort, to tear your skin only to re-tear it so that your blood stains the very rock on which you dedicate; to lay at the bottom of a problem in amazement of how hard can it really be and what do you need to do to conquer it, to approach a rock like a puzzle that requires all of your effort and focus. To be surrounded by like minded souls, who understand, who don’t judge; to feel the aliveness of the cold sharp rock against your skin and mind; to laugh at the absurdities of it all, knowing it’s just rocks, just movement, yet it is a way of being, a way of life… To know that magical day will come when everything clicks together and suddenly you are no more on the ground but floating up the very rock that once fought with your skin and mind, while remembering all the same how much you valued the process and apparent torment. As you lay on your pad lost in agaze at the rock above you, the edge of a green tree limbs catches your eyes and your gaze follows it to the top. The blue sky peeks through, a bird chirps nearby. The sound is of nature. You suddenly remember beyond the frustrations and toils why you do this. This lying on the pad, this pain in the tips,this climbing… it’s all ridiculous and preposterous fun. Thanks gus, Leslie-Ann, Marina and Alex for your kindness and friendship. And thanks to you, the reader, for reading…! If you’ve enjoyed this post please consider donating to the blog to help sustain these adventures.